Jeannie and Wally Linneweber of Vincennes, Indiana. Jeannie came in second place nationally in the AA non-irrigated corn category. Jeannie and Wally Linneweber farm on the same land where Wally's mother and several other generations of his family were born. 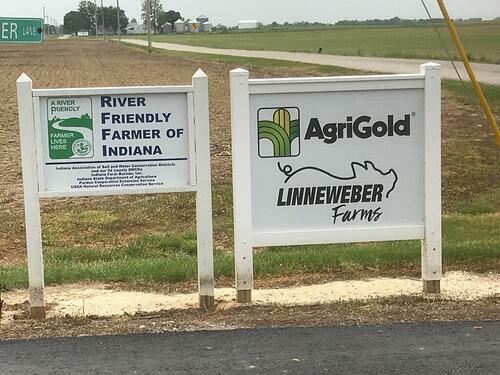 The Linnewebers grow a variety of row crops, typically corn, soybeans, milo (grain sorghum) and wheat. They also raise hogs on a contract basis in ten hog finishing buildings on their property. The couple is no stranger to the NCGA corn yield contest. In 2007 and 2015, they placed first nationwide. 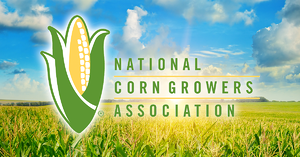 The couple placed second in 2009 and, in 2017, Jeannie took second place nationally for AA non-irrigated corn. The entrance to Linneweber Farms. "It's a great experience to participate in the contest," said Wally. "We know the seed companies personally, especially Pioneer Seed, and we have the privilege to test new genetics as they're made available first." The field they planted for the 2017 NCGA contest has been corn on corn for 30 years. They credit some of their success in the contest to the hog manure that they obtain from their finishing buildings and use as a fertilizer. Another part of their winning program in 2017 was Titan XC, which they used on their dry fertilizer for the first time after having it recommended by their crop advisors from Nutrien Ag Solutions. As for trying Titan XC, Wally says, "So far, so good!" John Wheatley, Nutrien Ag Solutions, Oaktown, Indiana (left) and Jeff Houchin, Branch Manager, Nutrien Ag Solutions, Decker, Indiana (right). 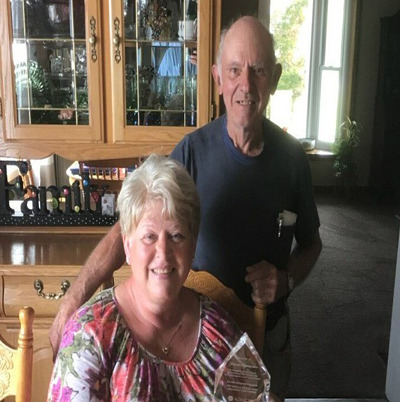 Jeannie and Wally began the 2017 NCGA contest as entrants in the no-till non-irrigated category, but ended up competing in the AA non-irrigated category after heavy, pounding rains forced them to replant about 600 acres of corn in mid-May of that year. Interestingly, the corn they did not tear out at replanting yielded 150 bushels less than the corn they did replant. In 2018, the couple will reduce their acres of corn planted due to prices, with more acreage devoted to soybeans. They also plan to compete in the NCGA corn yield contest again. We wish them and all of the other growers the best of luck! 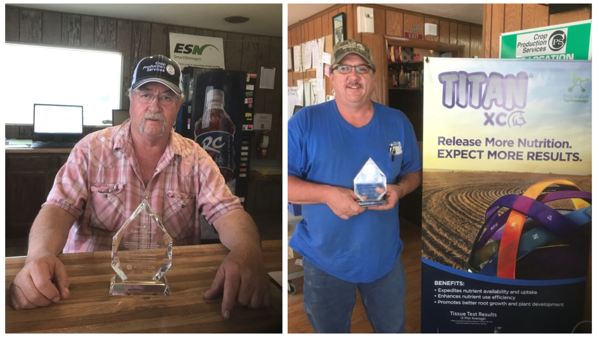 To find out more about the other winners who used a biocatalyst product like Titan XC, you can read our profile of Don Stall, national winner of the irrigated corn category, or Kevin and Shawn Kalb, who won two non-irrigated corn categories. You can also learn more about Titan XC by downloading the Titan XC booklet.